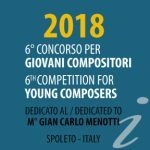 The Competition for Young Composers dedicated to “Giancarlo Menotti” represents both a homage to the figure of this Italian-American composer who has been so important for the city of Spoleto, and a concrete initiative in the discovery of new talents operating in the difficult field of classical music. 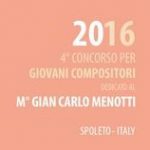 The figure of Menotti does not need any introduction or explanation. His compositions, especially in the operatic field are notable works of art that are still immensely popular at an international level. His role in the discovery of young, new talents is known as one of his personal trademarks. During the years of his tenure as Artistic Director of the Festival of Two Worlds, the artistic world has been enriched by a multitude of new fabulous performers in the musical and the theatrical area who still grace the stages of the entire world. 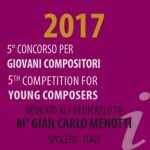 The Monini Foundation, following his example 5 years ago, conceived a competition for young composers to promote the activity of some of the most promising figures of the new musical generation, offering a monetary prize, but also giving the winners the privilege of an immediate execution of their winning composition. The Fondazione Francesca, Valentina and Luigi Antonini is the result of the special bond established by the Roman family of the Antonini with the city of Spoleto, where they spent their summers since the end of the 19th century. 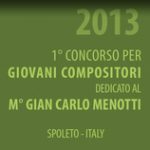 The purpose of the Foundation, established in 1973 by three Antonini brothers, was to perpetuate the special relationship that this family had with Spoleto during the years. 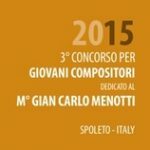 They decided to devote much of their wealth to initiatives that would help a small reality, as Spoleto was in the late 1960s, to face the new world of technology and modern society, without losing sight of its history, and its artistic, natural and historical heritage.